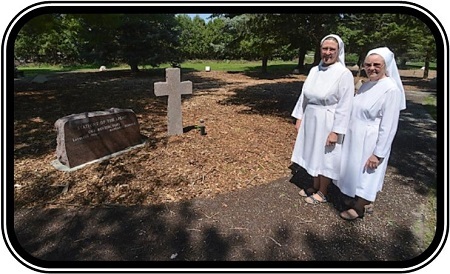 On Sunday, August 4, 2013, the Sisters of the Norfolk Priory hosted a dedication ceremony for the new Stations of Light pathway on the grounds of Immaculata Monastery. The public was invited for the dedication, ribbon cutting, and refreshments. Participants included Gianfranco Tassara, the owner of Inspired Artisans, Ltd. In Milwaukee, Wisconsin who was commissioned to design the pathway. Inspired Artisans, has served the Catholic Church in the design and creation of sacred art since 1997. “Our mission is to create beautiful works of art that meet the needs and visions of our clients. We take great satisfaction in our commitment to maintain a close relationship with each client.” Tassara said. The Stations of Light project features 14 bronze-colored reliefs depicting the Via Lucis or Stations of the Light. Artist Katie Musolff from Milwaukee, Wisconsin created the works of art. People of all faiths are invited to take time to visit and pray the Stations in the park. Benches are provided for those who wish to take more time for prayer and reflection in the peaceful atmosphere.